Merry Christmas Eve or Merry Christmas, depending on where you're located! Today I have another black with red glitter polish, although this one is quite different than Lippmann's Ruby Red Slippers I posted about yesterday. 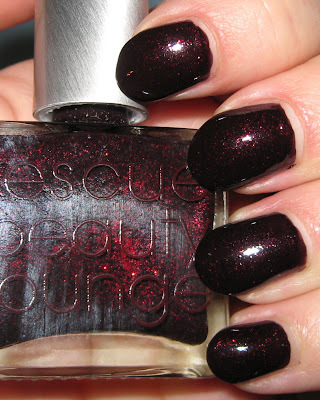 RBL's Black Russian is much more black with less noticeable red glitter than the Ruby Red Slippers, but it is still a wonderful shade. This applied in typical RBL fashion (2 coats), and I've got to admit, these have always had one of the best, if not the best formula of any polish I own. I'll keep this post short, because yes, it's Christmas Eve and I still have tons of wrapping and food prep to do! I hate wrapping! Hope you have a wonderful holiday, Mary! This is really besutiful. I still don't own any RBL polishes. Maybe one day. Gorgeous!! Love this polish on you. Hope you get all those presents wrapped and have a wonderful and merry Christmas!! So pretty... I really need to jump on this RBL bandwagon. 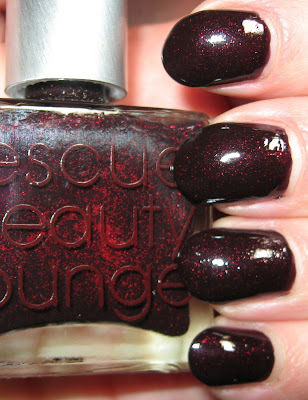 That is a stunning polish! Merry Christmas! This one is so pretty. I really like it when RBL does things like this, they should really do more glitters! Though I do love their creams quite a bit. That is stunning Mary! I was sick and missed the RBL sale, aaaaaaah woe is me haha. Maybe next year. Man! Mary I am not sure which of the two I like better, I really like them both - but I've been a sucker for black with red glitter ANYTHING ever since my first bottle of Lubu Heels. Happy holidays! I hope you have a wonderful day. I didn't buy that because I thought it would look like Ruby Red Slippers. This looks very different. I hate wrapping paper. Love that polish on you. Have a blessed Christmas and a joyus holiday. Love ya. rijaH~I'm sending you a plane ticket next year so you can come over and wrap my presents! Glad you like the polish! Mighty Lambchop~belated thank you for the wishes! Hope you enjoyed your Christmas! Euridice~I'm late (again!) answering comments, but yes, they were all wrapped just in time! Loreena~they are such a fantastic brand. I haven't tried one yet I didn't love. Phyrra~thank you and the same to you! Kae~yes, there's always next year! Happy Holidays to you and your family! Nicole~I'm with you, I like them all for their own special look! Happy Holidays! Konadomania~thank you, best of the New Year to you!